@Simba- What time did you tell them the shuttle was coming? The afternoon right? Voluminous forms, great trophies, and a safari?! This has been sent from the "brother" in Accra, so perhaps there are 3 mugus that spent the night in Parakou. Yeah, I was getting emails from the brother in Ghana but under Peter's account. It was weird. So there are numerous players here. One left at homebase, and the other mugu's that are in Parakou. This is strange...Has this been known to happen before? Way to go!!!! You have this(these) guys eating out of your hands. Excellent baiting, let me get you a cold one. They are already miles upon miles from home, so I don't expect them to be going anywhere anytime soon, I mean the big payday is coming in. I was talking to Simba through PM and this other mugu could be the boss that my mugu answers to, the one email that came in under the Ghana IP address ....could be. vehicle that we use for guest transportation to the 5imba Safari Camp. While on a rough stretch of rode, the van experienced a flat tire. realizing that the tire was flat, resulting in damage to the wheel rim. achieve your goal of visiting our lovely camp. shuttle, but it will suffice to get you from Natitingou to camp. Safari Group Ltd, so please do ask your taxi driver for a receipt. all of your unexpected expenses for travel in full. What is going on? I spent the day in the various camp activities and then went to dinner in the dining hall and such and I still do not see you here. I spoke with the director and he mentioned something about the shuttle breaking down, but did not give me all of the details. I am sorry that I have only responded just now, but I have limited internet access here at the camp. The director mentioned something about you taking a taxi to Natitingou as soon as possible, and the camp will pay for your expenses being is it had something to do with a flat tire, and for you to hold onto the reciept. Where is this park you speak of? Is it where the camp director said to be for pick up? I'm afraid if you don't get to where the director said to be at, you will miss another pick up. Please do as the director has said to do because we need to get his business transaction completed, and I am worried for your safety with all that gold dust you have with you. Please get back to me or the director and keep us informed. Mr. Peter, do try to get here soon, I got us a very large room and I have been alone the past couple of nights, so do hurry in getting here. I know nothing of which you speak of. I am not the director of the camp and I am not in charge of pick up's. I spoke with Bernie and Gloria and they said they gave your brother instructions to follow. I do know for fact these things: the shuttle had a flat tire, the next shuttle will be picking them up at Natitingou. I know they were instructed to get a taxi and take it from Parakou to Natitingou for the next pick up because something about the wheel rims were damaged and that shuttle will not be able to drive for a few days. Please tell Mr. Peter I have been alone at camp in such a large room, and he has not come yet. Please tell Mr. Peter to follow the directions as instructed because it is keeping us apart and I want to ship this gold dust he has for me to the US. Please tell him these things, as I am worried about his safety, and if he has any further questions about the pick up, he is to contact Bernie because I do not control the pick up's, because I am only a guest here. Images like that totally make me laugh out loud. I can just picture them all shacked up together in some dump. I hope the driver snores like crazy and keeps them awake all night. @ Smiba- Can we send them to Nigeria with an infestation at the Benin camp. Everyone in the camp gets transported to the Nigerian camp because of the African Giant Goat infestation that came in the camp-including my charater, or something cool like that? Don't know why it is that the "brother" seems to be doing most of the Emailing from Accra, but I suspect that these are being send from a home PC. A voicemail message too, which I haven't heard yet, but I'll ask VP to post to the thread. Rather than send them elsewhere today, I say we should give the boys a day of relaxation from their travels. I can assure them that a driver will be sent to collect them later this afternoon from the Tanguieta motor park. But there is a mix up in communication and the driver goes to Natitingou before returning to camp without them. 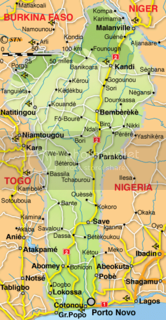 If you can find Cotonou right on the coast, then follow the yellow line North East to Parakou on this map, then look across North West till you find Natitingou, then Tanguieta is about 60km further North, close to the Pendjari National Park. Mr. Peter should be contacting the camp director. As I have explained in my last email, I do not have internet access like I do when I am home. The director is the one that makes the pick ups, not me. Me and Mr.Peter are guests and nothing more. Does Mr. Peter not have access to internet, while I get confused dealing with someone I do not know. My dealings have been with your brother and I do not know if you are sending them to places they do not belong. I know that you sent them to the town they are in now, but the director of the camp said to meet the shuttle in Natitingou.You sent them 60km more north then they needed to be at. I am a well educated woman, and I do know my geography quite well,I have to ask you Mr. Peter's brother, are you purposely trying to sabatage him so he does not get his money, and I do not get my gold dust? So at the end of this email, Mr.Peter needs to contact the director, not you to get the pick up directions, and Mr. Peter needs to read his own emails so there is no more confusion on his end. I hope I am making this quite clear, because you sir are holding up mine and your brother's business transaction.I have paid for his trip, and he saw the receipt of the transaction, so do not dare accuse me of anything of a negative nature. The next email that I get should be from your brother, as I am no longer interested in dealing with you, as I think you are trying to harm your brother.Mr. Peter's brother, I do not get a refund for the money I spent for your brother and I to have a nice, relaxing business transaction. I hope he does the right thing by emailing the director himself, and he should read the email that I only want to deal with him and him only. your group as soon as possible. vehicle with you at about 2:30pm today. that our driver has enough cash to settle up with you. Oh dear! I see trouble ahead!! That is an amazing bait. I definitely expect to see more things from you in the future. You have only been here a few weeks and you already have a safari under your belt. That's most impressive. Congrats on a superb job. I haven't replied, as I told them before there is limited internet access for me at the camp.